Its ironic I, a sola scripturaist, who places scripture in its Jewish context to understand it, is thus enlightened by the oral traditions Christ and His apostles knew intimately, while you, who profess adherence to scripture and tradition, reject the very oral tradition known to the apostles, in favor of Gentile conjecture about the Jewish Bible. The only thing that is ironic is that you, a self-styled Christian, take post-Incarnation Jewish oral tradition such as the Talmud (200-500 AD) as more reliable than Christian interpretation and Tradition. Besides, how can the rejectors of their own Messiah possibly understand the Old Testament correctly? If they did, they would be Christians. More proof that you're only interested in conjecture and forensic religion. The Talmud contains the beliefs of Jews, like the apostle Paul, in the days of Christ. NKJ Matthew 13:52 Then He said to them, "Therefore every scribe instructed concerning the kingdom of heaven is like a householder who brings out of his treasure things new and old." The proof of this is illustrated by NT eschatology, when Paul's beliefs as a Pharisee are known via the Talmud, the ambiguity of some NT statements vanishes. KJV Revelation 20:1 And I saw an angel come down from heaven, having the key of the bottomless pit and a great chain in his hand. Without the millennial reign of Christ, the above texts and many others are inexplicable. I am convinced God saves the overwhelming majority of mankind, via election, the book of life. When an elect dies unbelieving, he must go to hades to pay for his sins, but like the rich man in Luke c. 16, he repents and will rise in the Day of the Lord Jesus, into life. Paul doesn't know if this church goer was one of God's Elect, he does know from his deeds he isn't a Christian. So he says deliver such a one (who defiled the Temple of God i.e., the church, with his presence) to Satan to be physically killed, THAT his spirit MAY BE (if his name is written in the book of life) saved in the Day of the Lord Jesus, i.e., the final resurrection when Christ judges all mankind that ever lived. 3 For we have spent enough of our past lifetime in doing the will of the Gentiles-- when we walked in lewdness, lusts, drunkenness, revelries, drinking parties, and abominable idolatries. If the spirits in prison were not saved by Christ's preaching, then its not a like figure to how we are saved by the answer of a good conscience to the preaching of the Gospel. These "men of renown", being hybrid, whose souls were "spirits", were separated from humanity in death, and so dealt with separately. To stop this angelic scheme to contaminate the image of God with the image of angels is part of the great wickedness causing God to flood the earth. How do you know the Fathers didn't know relevant Jewish religious concepts? If they did, then they would have said the same things I do about Hades and the final resurrection. As we now have Jewish oral tradition written down, and translated into English, its accessible to Gentiles, the fathers didn't have access to it. Only Christ's generation, the Jewish apostles and disciples who founded the church knew this tradition, afterward the entire Jewish culture was disrupted by the destruction of the Temple, and the later expulsion of Jews from Israel. And the Jewish Christian presence in the church, who might have known these things, declined to virtually nothing. Logical fallacy... Something close to an argument from silence, together with an appeal to your own authority... Lack of agreement with you does not imply ignorance of what you know. They could very well have known relevant Jewish religious concepts better than you do yet still come to a conclusion that disagrees with yours. You also need to defend the appeal to antiquity in your statement that "earliest is usually best" is a fundamental principle. Why is this dictum axiomatic--that is to say, so fundamental as to not need proof? You mean Jews who became Christians, or Jews who rejected Christ because they didn't understand their own Scriptures? The Fathers are Christians, the earliest ones having been taught personally by the Apostles. Are you suggesting the Apostles didn't teach properly? Or that the Holy Spirit failed to guide the Church into all truth (see John 16:13)? Thank you for providing a list. Have you actually read these Fathers, or are you just reproducing a list compiled by someone else? You are, however, quite right to point out that many of the early Fathers taught millennialism. But do remember that early doesn't always translate to true. The Apostle Paul had to write a second letter to the Thessalonians to correct their misinterpretations concerning the return of Christ, about which he himself had taught them in his first letter! Also, do all of the Fathers you listed always agree with each other on points of eschatology? Unlike you, I won't claim expertise here, but I would be unsurprised to find out that each one of them has his own particular variation on a theme, just as "last days preachers" do today. Even Justin Martyr, one of the very earliest, admitted that his many Christians did not agree with him on the matter. Alfred, you know that many Protestants - even the most die-hard Evangelicals - rarely agree on the details of last things. It really isn't that important to our salvation. Yeah, well, whatever. Scripture reference please? I thought only the Book of Mormon (and related volumes) deal with the Americas. How could the early fathers not have known Jewish concepts since many read Josephus? Maximos the Confessor refers to clerics being literate of his writings in the 7th c.? Now this individual is claiming to have special knowledge of the apostolic period but at the same time disparaged the book of Enoch when the transmission of faith alongside the development of scripture in holy tradition was discussed. Who wrote the book of Enoch, a Zoarastrian? Bull. The Mishnah was written 150+ years after Christ, and the Gemarah centuries after that. How do you know the teachings were not tainted by anti-Christian sentiments in the interim? The Jews mutilated their own scriptures (MT) in reaction to Christian teachings, which was discussed at length earlier. Yet you think their oral traditions would have remained intact? That's rich. Especially when we consider your views of how untrustworthy oral tradition is. If the Holy Spirit could not prevent Christians from perverting Christian Tradition, as you believe, I struggle to imagine how the Jews could have remained faithful to their traditions without the Holy Spirit. Alfred, does your logos.com software have full texts of "The Mishnah" and "The Gemarah" and the armchair analysis of both "non-Christian" texts? The premise is in your claim tradition is worthwhile, the alleged apostolic connection is strongest where it is less removed. So you rebel against Christ when you diminish all Jewish oral tradition. Christ never mentioned the fathers at all, He did refer to scripture, and Jewish Tradition. As a Christian, I listen to Christ. Nothing in your reply answers the charge that you engaged in the logical fallacies of argument from silence and appeal to your own authority when you stated that the Fathers' disagreement with you implies their ignorance. But you haven't established that we diminish Jewish oral tradition. This is a ridiculous anachronism, in that none of the Fathers lived before or during the time of Christ--He would not have been able to mention those He preceded. In fact, His reference to Jewish Tradition actually sets a precedent for our reference to Christian Tradition. Even Jesus recognized the importance of following Tradition. And yes, Jesus did mention the Fathers of His people when He spoke of the Law and the Prophets. The Jewish oral tradition you cite—the Talmud—came centuries after Christ. How could he cite it? Or the Fathers of the Church, for that matter? Are you mad? However, nowhere in this passage is it stated that the Scriptures are meant to be the only thing inspired by the Holy Spirit, or the only thing that will bring one to Christian perfection. "one could embarrass an opponent by attacking the contrary of an argument rather than its contradictory." David Wooten found it impossible to contradict direct apostolic teaching and still be considered a Christian, hence he pretends our position is something else. We never said the scripture was the only thing inspired by the Holy Spirit, nor would we be that stupid. To argue what we didn't state is evasion, a disreputable tactic of deceivers. Of course this doesn't rule out God inspiring prophets and teachers, even ourselves as we read. Sola Scriptura does not mean "God inspired only the scripture," it means "only God's Word has Supreme Authority." It is after all, God's Word and He is The Supreme Being. "Red Herring...what happens if you feel that your defense has not been strong enough...What you must do is draw attention to a side issue." "We evade facts...when we are guilty of the fallacy of the complex question (i.e., argue a different issue)." We do not say scripture alone will save a man, no in their right mind says that. Sola Scriptura states we are to "obey God rather than men", a claim David Wooten is boorishly evading with sophistry, which is about as entertaining as one wrestler. Secondly, the passage in Mark 7—where Our Lord rebukes the Pharisees’ traditions which nullify the word of God—needs to be seen, again, in the light of what it does—as well as what it does not—say. So now David Wooten makes an argument from silence, after proving such argumentation is unsound! "By all means mix in your words with mine." God never said what David Wooten argues for. ). With what, the Evangelical asks, did Christ refute the errant traditions of the Pharisees? With the Word of God, the Scriptures, thus setting Scripture (so they would then say) over and above all traditions. In a sense, the Orthodox have very little problem with this. We would very much agree that all traditions practiced within the Church must not disagree with what is written in Scripture; in other words, they must not be anti-biblical. For us to jump, then, to the conclusion that all traditions must therefore be found explicitly within Scripture in order to be legitimate is to go further than even Christ Himself was willing to go. After stating sola scriptura correctly, he evades the issue, barely defeating yet another straw man, who almost bested him. Christ, the Orthodox would point out, did Himself validate and bless the continuation of traditional establishments within Judaism and, in so doing, endorses establishments whose continuations are sanctioned not at all by the Jewish canonical Scriptures set down at Jamnia (90 AD, the canon used by Protestants at large for their Old Testament text). David Wooten contradicts himself, if Christ validated the Jewish establishment, then their setting the OT canon at Jamnia was sanctioned by Christ. 2 saying: "The scribes and the Pharisees sit in Moses' seat. 3 "Therefore whatever they tell you to observe, that observe and do, but do not do according to their works; for they say, and do not do. These sat themselves down, never did God give them authority to do so. BUT they satisfied an important need, through them the people heard the Word of God. Before the printing press, Scripture copies were rare and only the very rich, or synagogues had them.
' Thus you have made the commandment of God of no effect by your tradition. 8 `These people draw near to Me with their mouth, And honor Me with their lips, But their heart is far from Me. 28 saying, "Did we not strictly command you not to teach in this name? And look, you have filled Jerusalem with your doctrine, and intend to bring this Man's blood on us!" 29 But Peter and the other apostles answered and said: "We ought to obey God rather than men. Sola scritpura is clearly taught, not only by explicit command, but also by apostolic practice. David Wooten consistently evades these facts misdirecting the reader to other issues that have nothing at all to do with sola scriptura. ...let us look at some passages from Scripture that we Orthodox believe are for extrabiblical tradition. Sola scriptura does not say all of God's Word was scripture in 51-52 AD, we agree with the Orthodox other books are NT canon, including the 21 Bible books written AFTER Paul wrote this. Sola scriptura simply states God's Word has Supreme authority, because God is The Supreme Being. David Wooten has yet to contradict that elegant statement. Observe the logic, if we confuse God's Word with the words of men, then its possible we won't be walking after the LORD our God, and keep His commandments, and obey His voice. We therefore cannot elevate the traditions of men to "Word of God" status, lest we fail God's test. Secondly, however, is the following question: How can the Evangelical assert that the oral traditions are the same as the written ones in the rest of Scripture? God affirms the Old Testament, by itself, is able to make wise unto salvation, as long as its testimony Jesus is the Christ, is accepted. Some have argued "See, both Paul and God MUST be wrong, scripture wasn't sufficient, He added the NT to the OT after Timothy became an adult." That also is misdirection, it looks at us rather than the God who cannot lie. Like inferring from the serving of food at the end of a banquet, that the guests were starving to death. Rather, it only shows the Host is generous, richly supplying beyond our needs. Otherwise the proposition ONLY Scripture has Supreme authority, because only it is God's Word, remains undiminished. The Bible says the Word of God is a Person. Apparently, you copied from another source with these references to David Wooten. Attribution of motives to your opponent that fit the logical fallacy of poisoning the well. You're attempting to refute David Wooten's article by casting the basest possible aspersions on his motives. First, that's a logical fallacy in that you're trying to discredit the person and not his arguments. Secondly, and most damningly to your arguments: David Wooten is highly respected on this forum, whereas you are not; your arguments are going to gain no traction with us whatsoever as long as you follow this tactic of slandering the motives of such a highly respected figure as David Wooten. Fallacy of the ellipsis... You're hiding something, text that could overturn your argument. Logical fallacy... You're equating the Scriptures with God Himself. The Scriptures reveal God to us; they are not God. The statement that we ought to obey God rather than men is not an argument for sola scriptura. Your argument also betrays the accusation you've made many times that church Tradition is merely the word of men, something we have stated many times is not how we view Tradition. If you're going to continue using as one of your foundational arguments your belief that Tradition is merely the word of men, you're going to have to first convince us that this is true. Otherwise, you risk falling into the trap of circular reasoning. Again, the logical fallacy of the appeal to motive. Stop accusing David Wooten of seeking to evade the truth and focus solely on his arguments. Again, your baseless assertion that Tradition is merely the word of men. Orthodox define Tradition as the life of the Holy Spirit within the Church as fulfillment of Christ's promise that the Holy Spirit will guide us into all truth. (John 16:12-15) Until you can address this, your belief that Tradition is nothing more than man's word means nothing to us. Where's the argument from silence in the above snippet? But for those who see Tradition as the life of the Holy Spirit within the Church, Tradition does not add to the words of God, Tradition IS the words of God. You keep identifying the Word of God with the Scriptures, even though the very Scriptures you call the Word of God never make this identification. What--or should I ask Who--is it that the Gospel of John identifies as the Word of God? Jesus Christ. Jesus Christ is the Word of God; the Scriptures merely bear witness to Him. Of course not, but we're not talking merely about the words of men. To us, Tradition is the guidance of the Holy Spirit. Who taught you that Sacred Tradition is merely the commandments of men? You misread David Wooten on this point. He did not say that Jesus validated the Jewish establishment. What he said is that Jesus blessed the continuation of traditional establishments--that is to say, traditions established--within Judaism, traditions not sanctioned by the Jewish Scriptures set down at Jamnia. What does this magisterium have to do with us? Sola scritpura is clearly taught, not only by explicit command, but also by apostolic practice. David Wooten consistently evades these facts misdirecting the reader to other issues that have nothing at all to do with sola scriptura. Yes, God's Word has supreme authority, because His Word is none other than Jesus Christ Himself. To call the Bible the Word of God is to make the Bible identical with Christ, and then to replace Christ with the Bible, which in the end only makes an idol of the Bible. He doesn't need to, because it's true--just not in the way you conceive it to be true. Straw man argument, since we don't identify Church Tradition with the Word of God. We've also dealt with the fact that this snippet you keep quoting from 1 Corinthians does not mean what you say it means. Again, Tradition is not the mere words of men, and Scripture is not the Word of God. Again, this passage of Scripture does not say what you keep saying it says. It does say that Scripture is able to make us wise unto salvation, but it doesn't say that Scripture alone is sufficient to make us wise unto salvation. The false identification of the Scriptures with the Word of God. The Scriptures are NOT the Word of God; rather, they bear witness to Him who is the Word of God. Likewise, Tradition is NOT the mere words of men; rather, it is the guidance of the Holy Spirit who bears witness to Him who is the Word of God. The Word of God is Jesus Christ. Until you understand and address this that I've said about the Word of God and about the Scripture and Tradition that bears witness to Him you're merely talking past us by proceeding from totally different definitions of foundational terms. You need to first prove to us that the Scriptures are the Word of God, and that we are wrong to attach this title to Jesus Christ, for your defense of sola scriptura to be convincing. BTW, Alfred, I think you owe David Wooten an apology for making such base accusations of his motives. When he posts on this forum, he does so as DavidBryan. I should apologize for identifying the fallacies he employed to contradict apostolic doctrine? Did Christ apologize for identifying rebellion against God? He can try to defend his use of fallacy against God's Word being Supreme , or against Scripture being the only place where God's word exists today (=Sola Scriptura). I will answer him. 6 ...Thus you have made the commandment of God of no effect by your tradition. 9 And in vain they worship Me, Teaching as doctrines the commandments of men.'" 11 "Not what goes into the mouth defiles a man; but what comes out of the mouth, this defiles a man." 12 Then His disciples came and said to Him, "Do You know that the Pharisees were offended when they heard this saying?" I made no personal attack, I identified fallacy, I owe no one an apology except perhaps God, for not doing this more consistently. I don't believe the Orthodox teach the Scripture is not the Word of God. I think you misrepresent Orthodoxy. Prove what you say, cite an Orthodox authority expressly saying the "Bible is NOT the Word of God." 11)Incorrect, you DO identify your tradition isn't the tradition of men, that leaves only a claim its the tradition of God. AS Scripture contains more than quotes of God, much of it is in a similar form to your tradition, BUT YOU call this tradition the "Word of God", your claim Orthodox tradition is of God's Tradition is equivalent to saying its the "word of God." Its understood "word of God" refers to more than actual quotes. They are not two separate entities that we judge against each other. Rather, the Scriptures are a part of Tradition, and so they cannot contradict each other. 1)Sola Scriptura = Only Scripture has Supreme Authority for only it is God's Word and He is the Supreme Being. THAT is sola scriptua, it is not a claim God only inspired the Bible. Its a claim only the Bible is indisputably God's Word. Everything else must prove whether it is God's Word or not. To argue a contrary is a disreputable act of deceivers. If David Wooten wants to defend his arguing a contrary, he should do so. I have never seen the truth defended with a contrary. One defends a position by contradicting arguments against it, not misdirecting attention to something else. AND I know I am not respected on this forum, and I have been called just about everything in the book, and my motives have been given the basest possible aspersions...therefore I didn't see anything in my post wasn't the norm here. However, I'll apologize if Dave Wooten confesses he use the fallacies listed in "The Art of Deception" ignorantly, that he didn't know any better. Then I will certainly apologize for assuming he did know what he was doing. 2)Fallacy of the ellipsis? If you want to allege dishonesty, prove it...the missing words were irrelevant to my point, that God inspired scripture HINA (in order that) the man of God be thoroughly equipped. That is precisely what the text says, while also affirming it doesn't lack "material sufficiency" as Catholics might argue...but you folks aren't Roman Catholics. Now underline the precise words that I omitted to misrepresent God in your "fallacy of ellipsis"
I observe you are ascribing the basest motives to my ellipsis, "I am hiding something", i.e., what "could overturn your argument." Prove it, cite the precise wording that overturns God inspired scripture "that the man of God may be complete, thoroughly equipped for EVERY good work". Caps mine. 3)David Wooten proved an argument from silence is unsound. That is correct, it is. BUT Sola Scriptura is NOT predicated upon an argument from silence, so its a RED HERRING. So you respond to that with a STRAW MAN fallacy. Who said Scriptures are God Himself? Copy paste the precise words where I ever said that. Church tradition is the word of men, and the burden of proof is on those who say it is not. 4)I didn't appeal to motive, I identified the argument as a "complex question" which is a fallacy listed in Nicholas Capaldi's book "The Art of Deception." We don't argue Scripture is God, that it does the saving, to allege we do is boorish, about as entertaining as watching one wrestler in action. 5)Sola Scriptura does not say the Bible is a Being that teaches, that it itself does the equipping. THat is NOT what Sola Scripture states, or implies. Sola Scriptura = Only Scripture has Supreme authority, because God is The Supreme Being and Scripture is indisputably God's Word. We haven't found God's Word outside of Scripture, therefore we proclaim that fact to all by affirming ONLY SCRIPTURE is God's Word. Sola Scriptura is the claim God's Word is Supreme because He is The Supreme Being. As Scripture IS God's Word, and we have not found God's Word apart from Scripture, ONLY it has Supreme authority. The ONLY WAY Sola Scriptura can be disproved is to prove 1)God is not The Supreme Being therefore His Word lacks Supreme Authority; Or, 2)That God's Word exists apart from Scripture. You folks affirm #2, but haven't proved it. Your traditions do nothing that indicates divine origin, such as predict the future, or make visible a Divine Truth hidden in scripture, as a prophet of God would. Tradition that is inspired by God would exhibit the same properties evident in His Holy Word the Bible, they would reflect His divine Genius or reveal what was hitherto unknown, but perfectly fits all prior revelation and is 100% consistent with Scripture. Resolving paradox men couldn't resolve without His inspiration, is also lacking in your traditions. Your traditions are just rules anyone could make, nothing about them indicates they are divine. Claiming to be a prophet is one thing...actually proving one is a prophet by revealing God and what He will do in the future is another. Your traditions do neither, yet you allege they are not the traditions of men. 32 "Whatever I command you, be careful to observe it; you shall not add to it nor take away from it. 3 "you shall not listen to the words of that prophet or that dreamer of dreams, for the LORD your God is testing you to know whether you love the LORD your God with all your heart and with all your soul. 4 "You shall walk after the LORD your God and fear Him, and keep His commandments and obey His voice, and you shall serve Him and hold fast to Him. Even if they work signs, we are not to consider their traditions additions to the Word of God. Fact is, your traditions are nebulous, undefined which belies any claim they can be on the same level as the "word of God." 6)David's Argument from silence = "as well as what it does not say" etc. He then fills in the silence by begging the question, asserting extra-biblical tradition exists that is the Word of God that doesn't contradict the explicit teaching of Scripture. That is precisely the point he needs to prove, not simply state. Sola Scriptura denies that precise claim of his, yet he says "it needs to be established at the onset." NO, it needs to be proved to disprove Sola Scriptura. Show us the divine property of your tradition that we must acknowledge can come only from God and cannot be simply a statement by men. Scripture proves it is the Word of God by its consistency, and foretelling the future. You failed to prove divine authorship of your tradition. 7)You can't have your cake and eat it too. Either Jesus sanctioned Jewish Traditions, or He didn't. I say He didn't and proved that in the next paragraph. 8)Its seems you Orthodox believe in the "Ordinary Magisterium," but not Papal Magisterium. You cite tradition of your bishops, but lack a pope. If that's incorrect, I stand corrected. The point I made remains, if Jesus sanctioned a Jewish Magisterium, then the apostles rebelled against Christ when they refused to follow the Jewish Magisterium, saying: ""We ought to obey God rather than men." Acts 5:29. 9) "We ought to obey God rather than men. 10)It was a statement of fact. Sola Scripture can be disproved only by proving God is not the Supreme Being and therefore His Words do not have Supreme Authority; or 2)That the Bible isn't the only deposit of God's Word. The Orthodox fail to prove either point. 10) Sola Scriptura is not calling the Bible Christ. That is absurd. Prove your claim, to say Jesus is the Word of God, and to say the words God speaks is the Word of God, is NOT saying there are thousands of Jesus' in the Bible. Your statement is absurd, a denial words can have more than one meaning. Its understood "word of God" includes more than actual quotes. I think I made my point...the post is getting too long. To sum up, I'll apologize for ascribing willful intent if Dave Wooten confesses he use the fallacies listed in "The Art of Deception" ignorantly, that he didn't know any better. I wonder if Alfred doesn't want to think of Christ as the Word of God, because Christ can't be manipulated like the Scriptures can. After all, we can control the Scriptures by just putting in "..." and not quote entire verses when what the entire verse would show that the verse(s) being quoted don't really support our point of view. Verses can be taken out of context seeming to say one thing, but if read in context really doesn't say that at all. Needless to say, others just pick verses or passages that support their belief while ignoring others that don't (the issue of "works" anyone and their place in our salvation, anyone?). Christ won't be manipulated as Alfred does with the Scriptures. Alfred, there should be no "..." in quotation of verses and verses shouldn't be quoted by themselves--they must be quoted within a passage because context is extremely important. Otherwise, you are manipulating the Scriptures to make them say what you want them to say. Alfred clearly does not understand the concept of Burden of Proof. He assumed the burden of proof when he came here claiming he would disprove Orthodoxy. But when confronted with something he can't refute, he says, "You're misrepresenting Orthodoxy." This has happened so many times, it's become a running gag. Alfred, the burden of proof is on you to prove we are wrong or misrepresenting Orthodoxy. I'm sure all of us would rather have a dialogue with you and work through it together, but it's clear you're only interested in debate. So, debate rules are in place. Since this is an Orthodox website, Orthodoxy is presumed true, and it's up to you to prove it's not, or that we are misrepresenting our beliefs. You certainly made a point. I'm not sure what it is, however. I stand by what I said above, 100%. I don't recall who said this in a prior post, but they were right on: the Scriptures are a testimony of the life of the Holy Spirit in the people of God. That was first Israel, then the Church. That is also what Holy Tradition is—the life of the Holy Spirit in the Church. See? They are both the life of the Holy Spirit. So contradiction is impossible. No, its not. All Christendom, including the Orthodox, say the Bible is the Word of God. If you claim otherwise for Orthodoxy, you must prove it. BUT if I accept your premise, then you are still guilty of adding your tradition to the tradition of God, because you lowered God tradition to the level of yours, and made them one entity. You are still confusing your teaching, with that of God. Our teaching and God's teaching are one and the same, because we are the Church. Claiming is not the same as proving. Sola Scripturists can prove their claim, see Josh McDowell "Evidence that Demands A Verdict." The proofs the Bible is the Word of God are irrefutable, and overwhelming. Your traditions manifest none of the properties of God's Word, how do I know this? You refusal to define it precisely and submit it to an ecumenical council for canonization. I suspect your nebulous tradition is purposely a "moving target" lest rational folks actually see what it is, and shoot it down. Our Church recognizes and accepts the Septuagint as the sacred and inspired Word of God. This version of the Bible circulated in the synagogues around the Mediterranean world where Christianity flourished. The New Testament canon was accepted as such by the conscience of the Church and guarded by the Holy Church as the most precious treasure. By the Fourth Century, the local synods of Hippo, 393, and Carthage, 397, included all twenty-seven books: whereas, the local synod of Laodicia in 350 excluded the Apocalypse (Revelation). It was finally included in the canon of the New Testament, authorized by the Sixth Ecumenical Council. Being the inspiration of the Holy Spirit, the Word of God, the Bible is kept in the Church with great respect and veneration, and guarded by the Holy Spirit, Who inspired the Holy Prophets. Oh! You got us. We've been keeping up the charade for the last 2000 years and you just figured it out. While we were holed up in the catacombs for the first few centuries, and our brothers were being dragged off to be executed, we hatched this ingenious plan. Again. You probably could get your mind around these matters if you would accept our explanations. But instead you groundlessly reject them, and in an abundance of paranoia, you jump to laughable conclusions such as the one above. Case in point: you want us to somehow define everything and "submit it to an ecumenical council". That is not at all how things work. We have explained this to you already, and you remain willfully ignorant and in the end look rather ridiculous. So far your responses are evasions...often rejecting Orthodox teaching---to prove Orthodoxy is to be accepted! Does he know what he's talking about? There were seven of them. Again, he grabs an Orthodox term and uses it for himself, thinking that will lend credence to his argument. Again, it doesn't work, because he doesn't really know what it means. That summary is spin. I will let PeterTheAleut speak for himself, but I don't think that's what he was saying at all. I think a lot of your misunderstandings are coming for yourself, not from us. Alfred, you really do need to read the authors you pretend to quote. If you had actually read the article, you would have found the Holy Scriptures referred to as "the word of God" - note the lack of upper case "w". That distinction of upper and lower case reflects what the Orthodox teach: the word of God is not, but does point to the Word of God, that is, to Jesus Christ. I think, Alfred, this is going to continue to go nowhere if you remain combative and willfully ignorant of what the Church teaches. Why don't you go on Amazon and order "The Orthodox Church" by Metropolitan Kallistos (Timothy Ware). That is the single best book you could read to get some basis of understanding in the Church. I say this because we are in the realm of the theologians here, which I myself struggle to understand much of the time. You have no Orthodox foundation at all, and I'm sorry, but there is no way you will be able to understand these things. You've never been to a single divine service (you could change that—it's Saturday, why not go to Vespers? ), you haven't read the Fathers. Your research goes as far as Google.com, and we can't take that seriously. Go read the book and come back when you at least have sand on which to build your understandings about Orthodoxy, because right now you have nothing. Of course, you can't really understand it until you live it (because it's a religion, not a philosophy). There is a reason why the unbaptized were expelled from services when it was time for the Eucharist. But with proper research you can at least speak academically about it. PROVE IT! 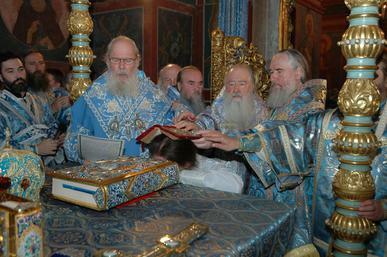 Prove to this forum that I'm misrepresenting Orthodoxy. If you're going to make that argument stick, you're going to have to prove that we define "Word of God" exactly the same way you do. We do not. Only if you elevate "words of God" to the level of "Word of God". We believe that the Scriptures are the words of God, but we reserve the title "Word of God" for Jesus Christ alone, lest we confuse the masses regarding who or what is the Word of God. Proving our allegation against you perfectly. You cherry pick those parts of Scripture that are relevant to your point and rearrange the words of those proof texts to make them fit your arguments. That is dishonest. But if all you're trying to spoon feed us is only those segments of biblical passages that prove your point, you're telling us only what you think the text says. We need to see the text in its context so we can read for ourselves what it says and choose to agree or not agree with you. That's honest debate. while also affirming it doesn't lack "material sufficiency" as Catholics might argue...but you folks aren't Roman Catholics. Nah, your use of the ellipsis makes that motive self-evident. Besides, I didn't comment on what I think you may be hiding, nor did I insinuate that you were hiding something with the intent to deceive us, so no I was not ascribing the basest motives to you. If you think about it, no ascription of motive could be more base than your own admission that you are here to proselytize us. No need to, since I don't disagree with the text of the Scripture itself. My only problem is with your exegesis/eisegesis of this passage. Since you're arguing an interpretation of Scripture that is new to many of us and that contradicts the faith received by most on this board, the burden of proof is on you to prove that your interpretation of this passage is correct. You have not done so. You still have not shown how he used an argument from silence. Not saying you ever did. I was just following the logical implications of your dogged insistence on identifying the Scriptures as the Word of God (as opposed to Jesus Christ being the Word of God and Scripture being the inspired words of God). Not on this forum. Burden of proof is dependent on who's arguing what where. If I were to come to a Protestant discussion board to argue that Tradition is more than just the words of men, then yes, the burden of proof would be on me to defend my thesis. However, this is an Orthodox Christian discussion board, where belief that Tradition is the guidance of the Holy Spirit within the Church is accepted as fundamental. You are the one challenging the consensus view of Tradition held on this thread and on this forum. The burden of proof is therefore on you to prove your claim that Tradition is merely the word of men. I proved my claim when I documented your tradition contradicts scripture. Circular reasoning... This statement assumes as its premise the conclusion you mean it to prove, that Scripture alone is God's Word. Again, circular reasoning... You have not found God's Word apart from Scripture because you believe so strongly that Scripture ALONE is God's Word that it's impossible to find God's Word apart from Scripture. The latter of which the Scriptures themselves attest when St. John calls Jesus Christ the Word of God. You folks affirm #2, but haven't proved it. Yes, we have. Read bogdan's quotes of the first chapter of the Gospel according to St. John. Your traditions do nothing that indicates divine origin, such as predict the future, or make visible a Divine Truth hidden in scripture, as a prophet of God would. 1. You've defined indication of divine origin to eliminate (in your mind) any possibility that Tradition could ever reveal its divine origin. That's called stacking the deck. 2. You've also blinded yourself to the many ways that the Holy Spirit has manifested Himself within the Church and through faithful Orthodox believers. Since you refuse to accept the invitation that has been made to you many times to come visit an Orthodox prayer service, I suppose you'll just continue to refuse to see how the Holy Spirit, the life of Tradition, makes Himself known in the Church. Who made this rule that traditions must be spelled out with exacting precision and thoroughness to be considered the words of God? Is this biblical? I thought you were trying to prove David Wooten WRONG. These are arguments for why you find him unconvincing. However, unconvincing does not equal wrong. If you're unconvinced, you're unconvinced. That merely tells us what we must do to convince you. You have no burden of proof to establish that. But if you're going to argue that David Wooten is WRONG, you're going well beyond merely saying he doesn't convince you. You then need to convince US that he is wrong. We don't need to. You need to prove to us that our Tradition is NOT divinely inspired. Yeah, because you're now repeating yourself. Yeah, we've already addressed this. Now, after seeing your continued obstinacy on this issue, and considering that it took me over an hour to draft the above reply (largely because I'm such an obstinate SOB myself), I think I've said more than enough and need to revert back to submitting short posts--no posts may be even better. I drafted the long replies above only because I encouraged you to actually prove your doctrine of sola scriptura to us, and the posts I dissected were merely your attempts to fulfill my request. I thank you for at least trying, but in so doing you only brought up other assertions that you need to prove, such as your fundamental premises that Scripture is the Word of God (as opposed to the inspired words of God) and that Tradition is merely the words of men. A prophet points to his prophecy as proof he is a prophet. A sola scripturaist points to the Bible which itself evidences many infallible proofs it is a divine book worthy of our loyalty. Where's the beef? You advertise your tradition as something special...yet all I see are icons and oddly dressed men. Why not a comparison? An objective test. Find an obscure text in scripture that sola scripturaist scholars confess is difficult...they do exist. Show how they fail but your tradition succeeds to remove the ambiguity. "Peter left NY at 10 am Thursday." "Peter entered NJ at 10am Thursday." At first glance, these are contradictory. But when it is known NY and NJ border each other, then they both are correct, just from a different perspective. THAT is what tradition should do, provide the missing pieces of a puzzle so that the picture becomes clear. If your tradition does not do that, its not tradition from God... its just rules by and for men. Inspired tradition would be analogous to inspired prophecy, it would bring to the fore what was there all along, but for some reason, no one saw it. Anything that contradicts the Bible fails the test, it rather must fit all the pieces of the picture puzzle together, without changing their shape, or forcing them to join together. Paul taught all are saved by God’s grace through faith (Eph 2:8), and as an expert in the OT he knew the children’s continuance in faith and charity does not ensure physical salvation during child birth (Gen 35:18). 1 Ti 2:15 Notwithstanding she shall be saved in childbearing, if they continue in faith and charity and holiness with sobriety. Does your tradition clarify this? 7 And He said to him, "Go, wash in the pool of Siloam " (which is translated, Sent). So he went and washed, and came back seeing. Why would God use clay and spit to heal? Why washing in Siloam? Does your tradition explain these things? If not, its quite useless. It certainly is not inspired teaching, which brings to light the things God has hidden. Hate to break it to you, but we've been doing it this way for 2000 years and nobody's really had a problem with it. Like I said, for many centuries—indeed, almost the entire history of the Church until very recently—only the baptized were allowed to witness the Eucharist, or hear the Creed. Imagine converting without really knowing the tenents of the religion until after you were committed. That is faith. But your rationalism is not faith. It's a bunch of data to be parsed. Well, that's not Orthodoxy. 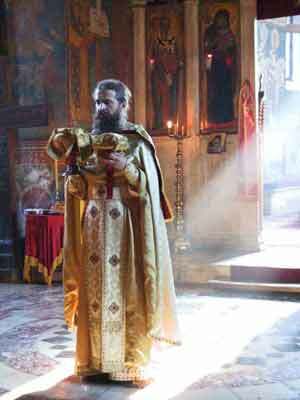 Orthodoxy is a life to be lived. Sorry we don't fix into the box of your preconceived ideas of what the Christian religion is. Hate to break it to you, but reread that post, I posted specific "obscure texts" for your tradition to explain. If it can, then it shows inspiration from God. If it cannot, then its just more tradition of men, useless in the scheme of things. How could this man's death perhaps lead to his spirit being saved in the Day of the Lord Jesus, Rev 20:12ff; Matt 25:31ff. How does preaching to the spiritual dead, whose sin leads to their death, enable living to God in the spirit? Paul taught all are saved by God’s grace through faith (Eph 2: , and as an expert in the OT he knew the children’s continuance in faith and charity does not ensure physical salvation during child birth (Gen 35:18). So, if our Tradition doesn't play by the rules you just set, rules made up by a man who posts here under the pseudonym Alfred Persson, it's not a Tradition from God? I have three words for that: Pot meet kettle! So what do you consider logos.com to be: a tradition of men or an inspiration from God? I was doing a good job in driving my post per day average down until I started challenging your weak positions in this thread. I used to average 12 posts a day until I realized that quality, rather than quantity, was what counted on this forum. Incorrect, that's my name, not a pseudonym. A prophet points to his prophecy as proof of his office. A sola scripturaist points to the many infallible proofs the Bible is a divine book as proof sola scriptura is sound. Paul pointed to the resurrection of Christ as proof Christianity is true. 10 For precept must be upon precept, precept upon precept, Line upon line, line upon line, Here a little, there a little." 12 To whom He said, "This is the rest with which You may cause the weary to rest," And, "This is the refreshing"; Yet they would not hear. 13 But the word of the LORD was to them, "Precept upon precept, precept upon precept, Line upon line, line upon line, Here a little, there a little," That they might go and fall backward, and be broken And snared and caught. Point to something in your tradition that evidences it is inspired of God, something men cannot duplicate. Men, without God, cannot turn bread and wine into the body and blood of Christ. Men, without God, cannot unite a man and woman in the sight of God. Men, without God, cannot join a person to the Body of Christ. Men, without God, cannot seal a person with the gift of the Holy Spirit. Men, without God, cannot administer holy unction for the healing of soul and body. Men, without God, cannot forgive sins and bind and loose in heaven and on earth. Men, without God, cannot ordain a man into the holy deaconate, priesthood, or episcopate. Men, without God, cannot depict God. Men can do none of these things without God. Yet we do them all the time in the Orthodox Church, the One Holy Catholic and Apostolic Church. So God is with us. "God is with us! Understand, all ye nations, and submit yourselves: For God is with us!" This brings to mind a line from the movie "Tommy Boy". Please forgive me for not quoting it, but I think it has something to do with a bull and a butcher. NKJ Matthew 24:24 "For false christs and false prophets will rise and show great signs and wonders to deceive, if possible, even the elect. Neither does any of the other activities you mentioned. 19 Then the secret was revealed to Daniel in a night vision. So Daniel blessed the God of heaven. 20 Daniel answered and said: "Blessed be the name of God forever and ever, For wisdom and might are His. 21 And He changes the times and the seasons; He removes kings and raises up kings; He gives wisdom to the wise And knowledge to those who have understanding. 22 He reveals deep and secret things; He knows what is in the darkness, And light dwells with Him. 23 "I thank You and praise You, O God of my fathers; You have given me wisdom and might, And have now made known to me what we asked of You, For You have made known to us the king's demand." Your traditions will fail the test, but Sola Scriptura will pass, for it shines God's light in the dark place, it makes visible the obscure, by relying upon the details of the text, upon the natural meaning of God's Holy Word, and His Word is always true. The problem you keep facing, Alfred, is that you keep trying to shift the burden of proof onto us. We have no burden to prove our Tradition to you; rather, it is you who must prove your tradition to us. Therefore we request that from henceforth you do not cause us more grief, nor write to us on the same subject if you should wish to treat these luminaries and theologians of the Church in a different manner [than we]. You honor and exalt them in words, but you reject them in deeds. For you try to prove our weapons, which are their holy and divine discourses, as unsuitable. And it is with these documents that we would have to write and contradict you. Thus, as for you, please release us from these cares. Therefore, going about your own ways, write no longer concerning dogmas; but if you do, write only for friendship's sake. Farewell.